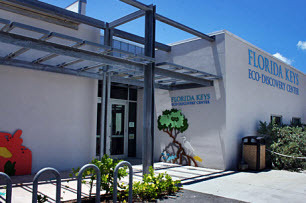 The Florida Keys Eco Discovery Center is free to visit! That’s not the most amazing thing about this, one of Key West Attractions, but it is certainly worth mentioning, as we then describe what you get for Free. Yep, we did it again. As you step through the doors of this 6,000 square feet Old Town attraction, built for a cost of $6,000,000.00, you will step into the world that is happening throughout the keys. Although this is nature we are talking about, so for most of us the information that is presented is about things we had never really thought about before. We will do now. 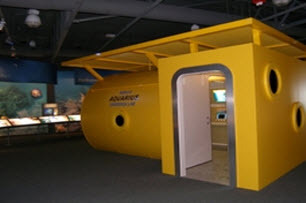 The National Oceanic and Atmospheric Administration’s National Marine Sanctuary of the Florida Keys, the National Park Service and the US Fish and Wildlife Service have done a great job, as the exhibit is really interactive which makes it particularly good for young children. They will love the touch screen computers that are all over the center. Not only being fun,they will really help you get into way the center show the ecology of all the Keys habitats. Located at historic Truman waterfront, the visit starts with a great 22 minute film made by the director of the film “Free Willy” fame. During the showing you will be taken on an exciting trip from the land to under the sea, to see how everything “Natural” has its own way of doing things. Even though they may not be evident to begin with. Another very interesting exhibit is the small tank within the center that contains the Lionfish. 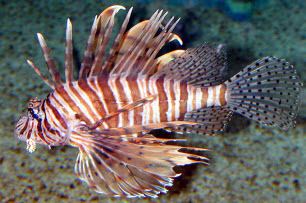 The lionfish is a really horrible and dangerous marine creature that is causing havoc throughout the Florida Keys. It has many different names, from Fire Fish, to Turkey Fish (not sure why its called that though) and is devouring everything in the waters around the Keys. It is at the top of the food chain, so really has nothing to knock it off its perch, which causes huge problems for the eco-system.....and that includes us humans too. So the center one of the great Key West Attractions explain how they are working hard to remove these fish from our waters, as you wouldn't want to think that as you walk around the best beaches in the Florida Keys the blue waters in front of you are a still and empty place. And the ironic thing is, they wouldn't have been in our waters if it wasn't for us. Oops bit of a mistake there humans! If you are driving your car and you are worried about potential parking problems at the Discovery Center then don't worry. I have always found parking to be plentiful and once again free.